COLUMBUS, Ohio – While the Washington players and staff showered and packed their bags before boarding a bus, Mike Hopkins sat in quiet contemplation inside an adjacent empty locker room in Nationwide Arena. The pain from an 81-59 defeat against No. 1-seed North Carolina in the second round of the NCAA tournament was still fresh and raw. And yet, the Washington coach spoke with optimism and conviction that the lopsided loss is proof that the Huskies, who finished their season at 27-9, are on the right path. “Two years ago I made a comment that this wasn’t a rebuild, this is a takeover, and they kept looking at me like I was nuts,” Hopkins said. “But this staff and I got them to believe, and they worked hard. They ended up being champions. They won 27 games. The Huskies won 15 consecutive games in Alaska Airlines Arena. They easily captured the Pac-12 regular-season championship with a 15-3 record. At one point, Washington won 15 of 16 games. But the Huskies also stumbled at the end and finished the year 5-4. The Huskies won when they were supposed to win and never lost consecutive games. Conversely, Washington fell short every single time against superior teams and failed to capture that elusive signature victory. Seven of the eight teams that beat Washington participated in the NCAA tournament, and five (Oregon, Auburn, Gonzaga, Virginia Tech and North Carolina) have advanced to the Sweet 16. Here’s a look at three questions for the Huskies heading into the offseason. WHAT WILL JAYLEN NOWELL DO? Washington fans will closely monitor the situation involving Nowell, the Pac-12 player of the year, who is considering leaving the Huskies to enter the NBA draft. The 6-foot-4 guard has led Washington in scoring the past two seasons while averaging 16.0 points as a freshman and 16.2 as a sophomore. This season, he took over the backup point guard role and shared playmaking duties with David Crisp. Nowell’s assists improved from 2.7 per game in his first year to 3.1 this season. And he made significant improvement as a shooter. As a freshman, Nowell shot 45.1 percent from the field and 35.1 on three-pointers. This season, he shot 50.2 percent on field goals and 44.0 behind the arc. You could argue that another year in college would allow Nowell to season his playmaking abilities and shore up his ball-handling. He averaged 2.9 turnovers. Considering UW is losing four seniors and will have just one senior scholarship player on the roster next season (Sam Timmins), Nowell could enhance his leadership skills if he remained. Nowell, who would break UW’s career scoring record — held by the late Christian Welp — if he maintained his current scoring pace for another two years, would be a preseason favorite for national awards if he were to return. But there are several good reasons to leave as well. Nowell is projected as the fourth selection in the second round (No. 34 overall) by NBAdraft.net. Still, there’s hardly a consensus of opinion on Nowell, considering ESPN doesn’t include him among its top 100 draft prospects. “Our goal is for these guys to get a great education and to try to help make their dreams come true,” Hopkins said. “As a coach, if it’s the right thing or the wrong thing, we don’t know yet. There’s so much information, but he had an incredible year. If Nowell stays in school, he would be the first Pac-12 player of the year winner to return since Sean Elliott in 1989. Nowell plans to consult with his family and didn’t give a timeline on when he’ll make a decision. The deadline for underclassmen to declare for the draft is April 21. Players who do elect to declare early will have until the NCAA deadline of May 29 to withdraw from the draft and retain their college eligibility, provided they do not hire an agent. The 2019 NBA Draft is June 20. 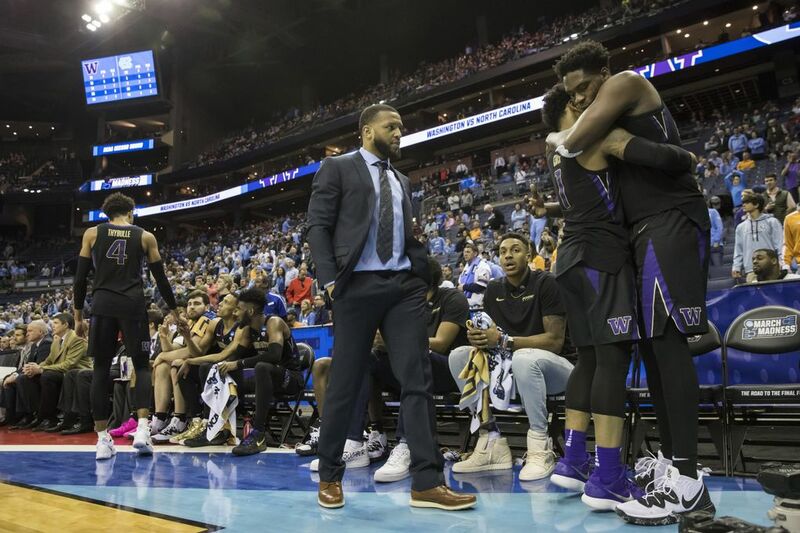 Even if Nowell stays in school, the Huskies are losing a whole lot of firepower and experience with the departures of seniors Matisse Thybulle, Noah Dickerson, David Crisp and Dominic Green. Thybulle, who set Pac-12 season and career steals records with 126 and 331, respectively, is arguably the greatest defensive player in conference history. He also finished second on UW’s career blocks list with 185, one shy of Welp. Dickerson is one of five players in Husky history to finish with at least 1,600 points and 900 rebounds. Crisp ranks 13th on UW’s career scoring list with 1,507 points. And the Huskies were 21-4 the past two seasons when Green hit at least two three-pointers. Washington’s four seniors combined to play in 532 games with 362 starts. If Nowell leaves, then Carter, who averaged 8.1 points off the bench, would be the leading returning scorer and likely slide into Nowell’s role. Carter acknowledged he’s going to have to be a more vocal leader next season. Carter displayed flashes of greatness the past two seasons. He’s a dynamic one-on-one player who has an ability to get to the rim and finish with an array of shots. Carter scored 18 points at Utah and Oregon State to lead UW to victories this season. He tallied 13 points in Washington’s 78-61 triumph over Utah State in the NCAA tournament opener. Carter scored 10 points in the first half against North Carolina, but for some reason he played fewer than four minutes after the break and was scoreless in the second half. And if you’re looking for candidates to lead, don’t forget Quade Green. The 6-foot sophomore point guard who transferred in January from Kentucky will miss the non-conference games next season due to NCAA rules, but Hopkins and players say he’s been a valuable contributor in practice. WHAT’S NEXT FOR THE HUSKIES? 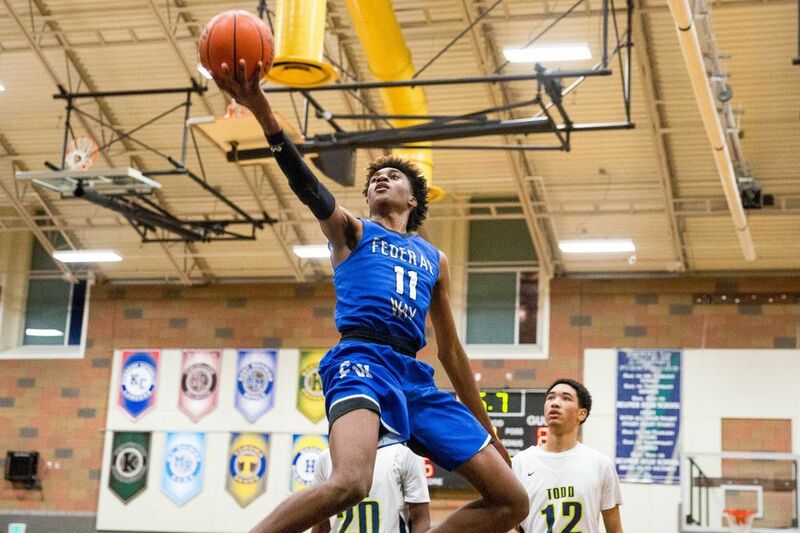 Hopkins and his staff will closely monitor the McDonald’s All-American game this week in Atlanta to keep tabs on Isaiah Stewart and Jaden McDaniels. Stewart has verbally committed to the Huskies, while McDaniels is UW’s top recruiting target. Securing two five-star prospects who are projected to be lottery picks in the 2020 draft would seemingly offset the loss of UW’s four seniors and potentially improve a team that won 27 games. The addition of Stewart, a burly 6-9 power forward, and McDaniels, a versatile 6-10 wing, also would bolster Washington’s front line. The Huskies are well stocked with big men, including sophomore Hameir Wright, Timmins and freshmen Bryan Penn-Johnson, Nate Roberts and Riley Sorn. Freshman guard Jamal Bey, who has a 6-10 wingspan, could slide into Thybulle’s spot in the 2-3 zone. But Washington is going to need an immediate contribution from several young guards including freshman Elijah Hardy and incoming freshmen RaeQuan Battle and Marcus Tsohonis. “When we get back and you got to start mentally thinking about how we’re going to start working in April and getting these guys back,” Hopkins said. “How are we going to start building? And let them know what we expect from them for the last quarter of school in terms of academics. UW’s potential lineup next season.